I just can’t get used to the compass reading “S” after so many miles of heading “N.” Yesterday, marked the real beginning of our trend back home. We left Elfin Cove about 7:30, after filling with water, in pretty thick fog running slow and on radar but within 45 minutes, it lifted enough to get the boat up on plane again. We headed through a beautiful channel called Lisianski Inlet, stopping along the way to try again for salmon. I think they must be extinct! We did get some Greenling Kelp, which I never caught before, as well as two Rockfish. After cleaning the fish, we toured Stag Bay, which reminded me of Ford’s Terror, without the ice and not quite as dramatic but still very impressive. As we headed out of Lisianski Straight into the open ocean, the swells and wind through us around a little bit. I don’t mind the swells but they really freak Val out. The boat climbs them and about 20 knots and surfs down them at about 25. It is a pretty weird feeling. Then, we had about 2-3’ wind waves on top of that and it was a bit of a sloppy ride but, again, nothing that we couldn’t all handle just fine. We only ran a few miles before ducking into a little harbor called Mirror Harbor, which looks like someone spilled a pepper shaker on the chart. I read the cruising guide on how to enter. It was very hairy! Both boys on deck looking for rocks, Val reading the step by step navigations directions…the charts here are not like the ones back in WA. We had to back up several times to miss rocks but we picked our way to a temporary anchorage hole and launched the dinghy. Just as we were ready to leave, it quite raining and got a bit brighter out. 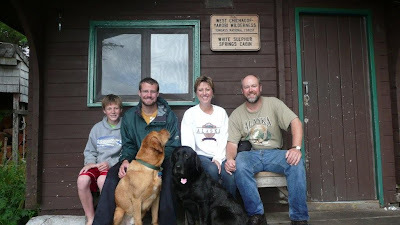 We met some folks in Elfin Cove who had just come up that way and told us about White Sulfur Hot Springs. So, we set out to find them. Sure enough, after a 1 mile dinghy ride and another mile hike, we found the little Forrest Service cabin complete with a natural indoor and outdoor hot tub! This was pretty neat! The hot water bubbles up and in and washes over the edge. We spent a couple of hours soaking, swimming, and exploring. Cody even jumped in the ocean for a second! Brrr! 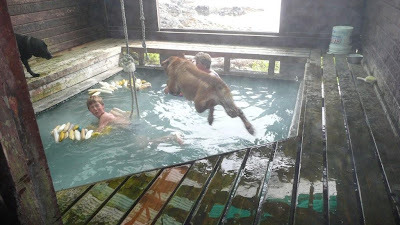 Tanner and Lucky even got to try the hot tub (no worries, they self clean with the constant water flowing through.) 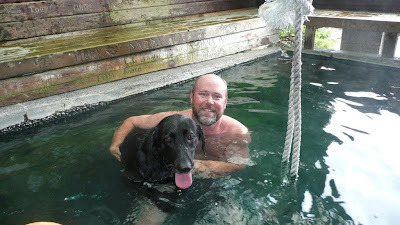 Tanner and Connor were totally out of control wild while Lucky, Cody, Mom, and I enjoyed the relaxation. Back to the boat, stow the dinghy, pull the anchor and pick our way back out to the open ocean. We ran with the last of the incoming tide with the wind slopping along another few miles to Imperial Pass, which some call the “Outside Inside Passage.” This proved to be a flat route but I nearly got dizzy navigating around the “peppered” islands. My GPS charts aren’t lining up with the real world in this area, which makes things real interesting. But we got to our Klag Bay anchorage about 6PM in fine order. I think we’re about half way between Elfin Cove and Sitka. Oh my, we had the best meal last night! For appies, we had some canned smoked salmon we got in Juneau; then, Val made this great Sockeye Salmon that we caught the other day. 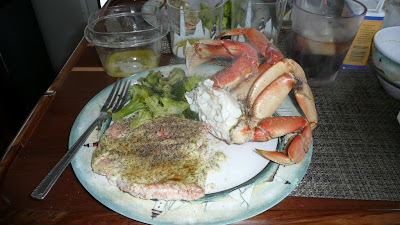 After that, we had these huge monster Dungeness Crabs that we bought off the fuel dock in Elfin Cove. They were the biggest, fattest dungies I’ve ever seen. We paid $7 each for them. In WA, they cost $16 each and are half the size! I hate to admit that we’re buying crabs and I even felt bad doing it, but we’ve put our stinkin’ pot out every night and come up with nothing! We gave up on the shrimp pot because I can’t get anyone to participate in pulling it up hundreds of feet each time. At any rate, we are getting a lot of good eating in! Well, the family is up and it and ready for the next big adventure, so I better wrap this up. We’re going to Chicagof, at the end of Klag Bay here to find an old abandon gold mine. I think our chances of finding gold are better than finding salmon! Hope you are all having a fabulous summer!